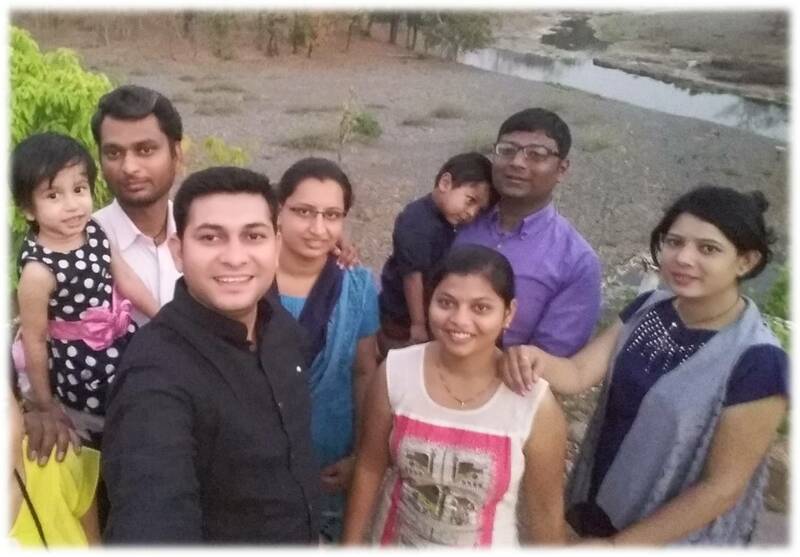 I visited Melghat Tiger Reserve (MTR) and Chikhaldara on 2-4 April 2017 with family and friends. We stayed at Semadoh Ecotourism Complex on 2nd and 3rd Apr and we visited Chikhaldara hill station on 4th Apr 2017. In this article, I am writing my experiences because the reviews and information, I got from web which is not current situation (like there is a solar system for electricity or there is no air cooler provided). I am not saying that the information is wrong but the things are changes as I experiences. Firstly, I want to clear that, if you going to visit Melghat Tiger Reserve (MTR) to see Tiger then you will be disappointed (But recent news proves that there is existence of tigers but there are rare chances of tiger sighting in Jungle safari). If you are expecting to see lot animals in Jungle safari then also you will not be happy with your trip, but if you want to enjoy the untouched beauty of nature then this is the place for you. I think, this is one of the best places for honeymoon. 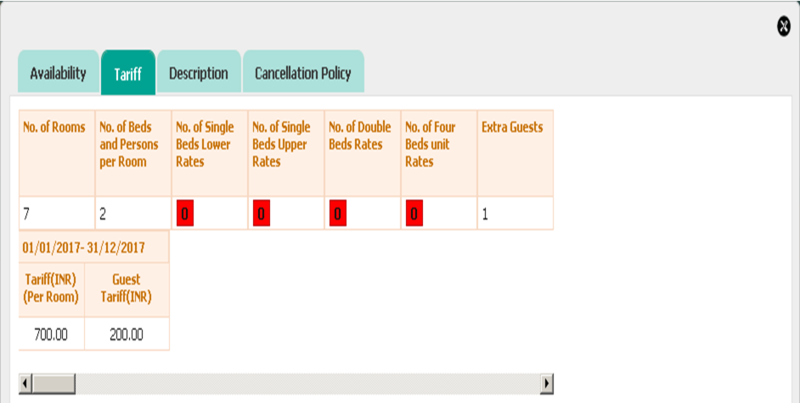 There are four types of booking for MTR. a. Jungle safari - This can be done online and offline. The online booking for jungle safari can be done through https://nationalpark.mahaonline.gov.in/User/Availability.aspx Jungle safari booking includes jungle safari entry fees and vehicle parking at Semadoh Ecotourism Complex. The MTR entry fee is Rs. 30 per adult person and Rs. 15 per child. The vehicle entry fee is Rs. 60 (online booking) or Rs. 100 (offline booking). Online processing fess is Rs. 35. At the time of online booking, system asks jungle safari date, time and MTR core area entry gate. My guide suggests that, it is better to take jungle safari in the evening time rather than morning time. There are four gates to enter in MTR’s core area. Pipalpadav (recently changed to Semadoh) and Sipna are two main gates. Pipalpadav (recently changed to Semadoh) is the best gate to enter in the core area of MTR, but the only thing is that, you have to start early morning otherwise visitor’s rush minimises the chances of wild animals sighting. 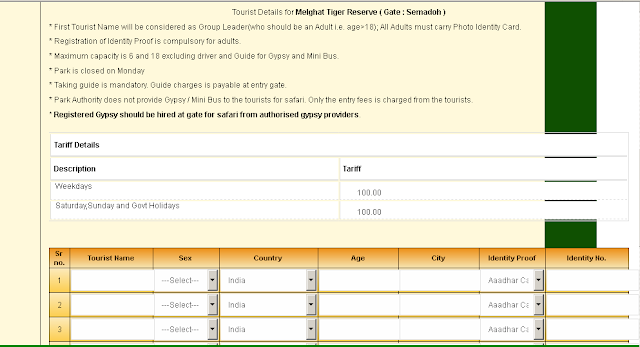 While online booking for jungle safari, do not worry about gate because guide chooses the best gate as per the situation. In our case, we have booked for Pipalpadav gate but we started late, so our guide suggested us to enter from Sipna gate and exit from Pipalpadav gate. If you have an online booking then keep extra copies of booking with you because receptionist at MTR office will keep a copy of each online booking with him/her. And staffs at the gates are not educated to understand online things, otherwise be ready to pay vehicle entry charges again at exit gate. If in case you pay again check that all details like date, vehicle no etc are filled or not. Offline jungle safari booking means spot booking at Semadoh Ecotourism Complex. 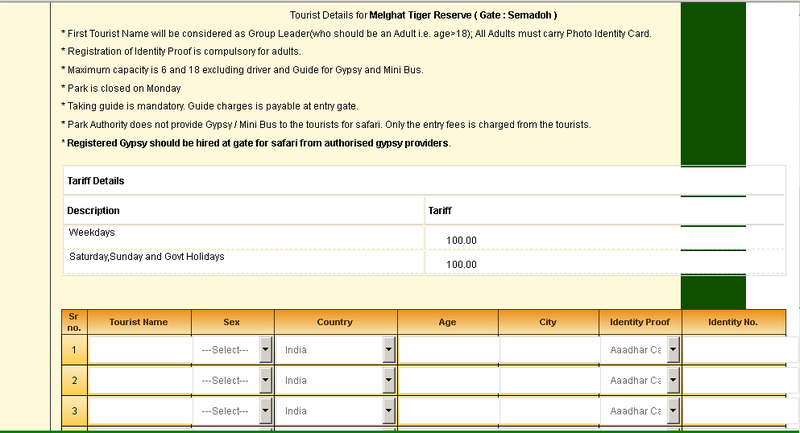 Offline booking does not guarantee of availability of jungle safari, so it is better to book it online. b. Vehicle - You can take your vehicle for Jungle safari, it cost Rs. 300 as an entry fee but it is advisable to hire gypsy. There is no way to book gypsy in advance but it is easily available if you inquire at village or Semadoh Ecotourism Complex. Each gypsy can carry 6 persons + 1 compulsory guide. We paid Rs. 2000 for gypsy, you can negotiate for gypsy. Appropriate cost for a gypsy is Rs. 1500. Our gypsy driver was Sharad and his number is 09209050405.
c. Guide - You have to take a guide with you, whether you take own vehicle or hire gypsy. Before you start your Jungle safari, you have to pay entry fee (if you have not booked and paid online) and guide fee at Semadoh Ecotourism Complex. There is no online facility for paying guide fee. The person at reception will allot you a guide. We paid Rs. 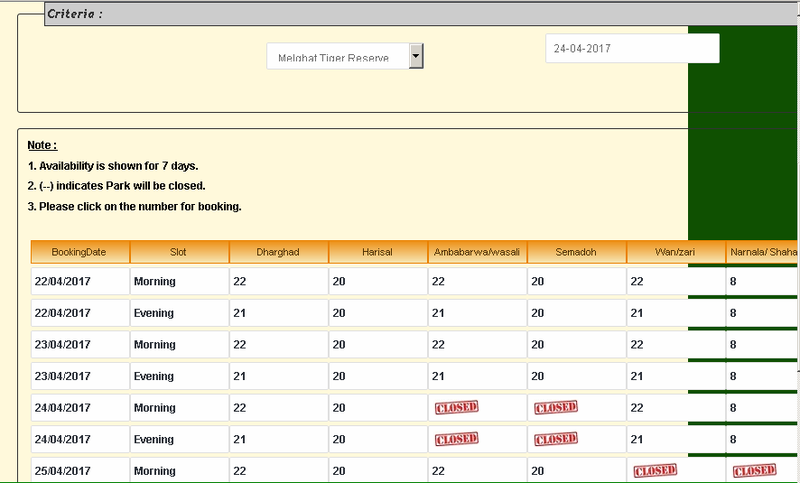 240 as a guide fees, from June 1, 2017 it will be Rs. 300.
d. Accommodation - Accommodation is available at Semadoh Ecotourism Complex, Kolkaz Ecotourism Complex and Chikhaldara Ecotourism Complex. The accommodation booking can be done online and offline. 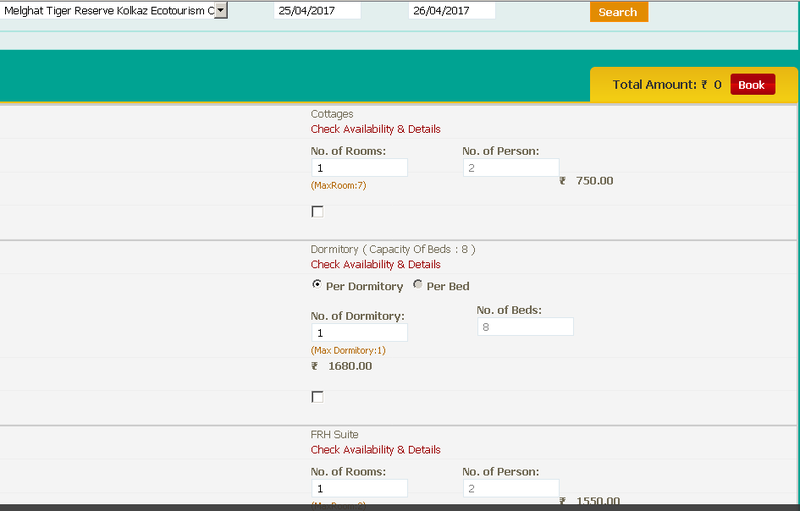 The online booking for accommodation can be done through https://accommodation.mahaonline.gov.in/Home/Index.aspx. We booked eco huts (cottage) at Semadoh Ecotourism Complex that cost Rs. 750/room/day. The cottage rates are same for Semadoh Ecotourism Complex and Kolkaz Ecotourism Complex. Semadoh Ecotourism Complex is better than Kolkaz Ecotourism Complex in context of rooms, jungle safari, interpretation centre and access to village. But if you want quiet place then Kolkaz Ecotourism Complex is the place for you. My advice to book FRH suite (VIP Rest House) at Kolkaz that cost Rs. 1600/suit/day, but it is worth to spend this money because it has a very nice landscape view of Sipna river and forest. You can find details on above mentioned website. To enter in MTR area, there are three check gates Harisal, Akot and Memna (Chikhaldara). We have to visit Chikhaldara after MTR, so we entered through Harisal check gate to enjoy the forest. Many people wrote in their review that, from Burhanpur to Semadoh is bad road but fact is that Burhanpur to MP border road is very nice, but onwards it is so-so (can drive @60 km/hr). And in MTR, some part of road is too good and some part is too bad (road repair work was going on). Google map shows correct travelling time. To go to the Chikhaldara we exited from Memna (Chikhaldara) check gate. Do not travel at night time from Semadoh to Chikhaldara though Mamna check gate. The road is very lonely and it is also difficult to drive at night. In my opinion pre-winter is the best time to enjoy beauty of MTR. Everything is green; river is flowing and descent weather. If you want to see animals then summer is the best period, but do not spend afternoon at Semadoh Ecotourism Complex. We stayed in eco hut (cottage) at Semadoh Ecotourism Complex. The cottage was so neat and clean. There were two separate cots, bed, white bed sheet, pillow and blanket. Also, the cottage was equipped a table, two chairs, small dressing table, small water camper, glass and cupboard. The cottage has two electricity plugs to charge electronic devices, one fan (not cooler, as I read in various reviews), and one light which low in fluorescence. Bathroom and toilet were very clean and it has two buckets, two mugs and electric (not solar) water geyser. 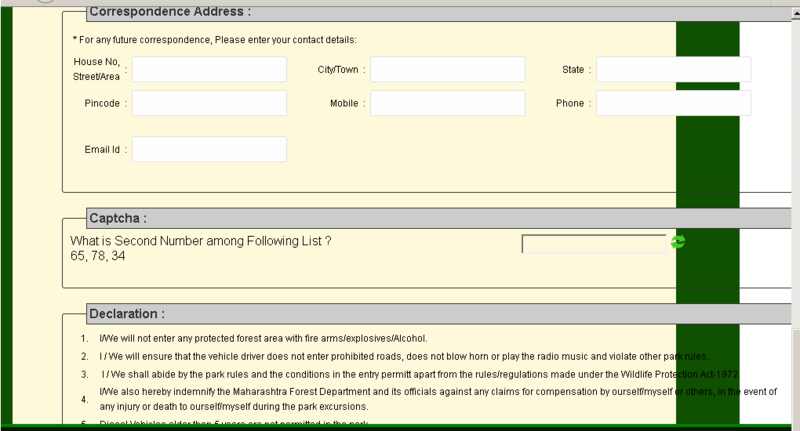 Forest department is providing beyond my expectations within core forest area in a very cheap rate. The problem is about availability of electricity. In various reviews, I read that, solar panels are the source of electricity so it will be available between 8 pm to 10 am, but now solar panels are damaged, so we have to rely on Maharashtra Electricity Board for the electricity. When we stayed, there was a huge electricity load shedding (from 2 pm to 10 pm and also at night time). There is diesel electricity generator facility to provide electricity from 8 pm to 10 pm. Even though, there was no electricity at night time of summer, it was quite cold (just think about winter’s night). As there was no electricity in the afternoon, we felt uneasy in the room because there was around 35° C temperature. Canteen is available at Semadoh ecotourism complex. Also, you will find some small hotels in the village. We had taken lunch, dinner and breakfast at canteen. Do not expect too much, but the food (especially dal tadka and aaloo paratha) was good. Food bill (1 lunch, 1 dinner and 1 breakfast) of 8 persons was Rs. 2285. People at canteen are very cooperative. They assured us that they will be available for us at night also. If small child is with you then milk can be arranged from canteen. Contact number for canteen is 09209932824 (Kunal). As I mentioned earlier that do not expect too much in Jungle safari but you can enjoy the nature. Other than jungle safari you can do other things. Semadoh campus - At Semadoh ecotourism complex, there is an interpretation centre. When we visited Semadoh, it was under renovation. Semadoh ecotourism complex campus is very nice. Kolkaz campus - You can visit Kolkaz ecotourism tourist complex without paying extra. 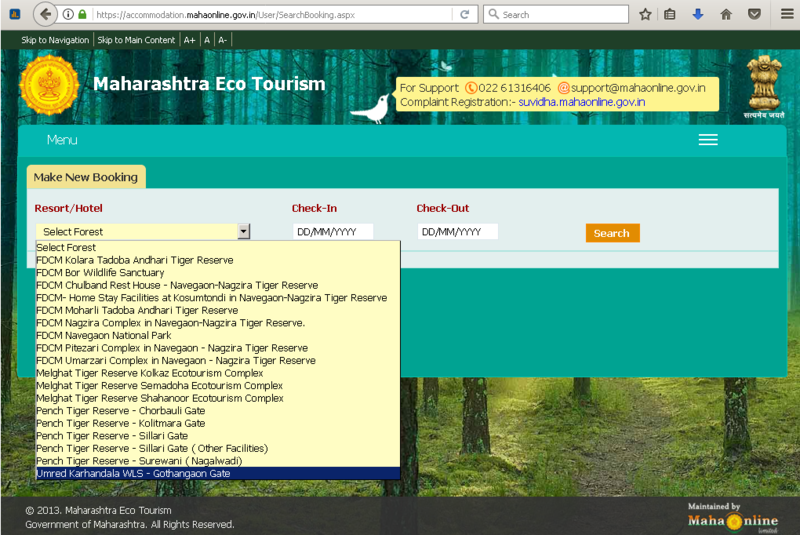 The only thing is that, you have to show entry slip (online booking slip). Kolkaz ecotourism complex has a better scenery view of Sipna river and forest landscape than Semadoh ecotourism complex. You can have chance to view wild animals in morning and evening time at the bank of Sipna river. We saw sloth bear with her baby at evening. Local guys told us that there is TATA indicom range. In some places, you can get Idea and Vodaphone range. But, it is good to spend holidays without a cell phone. There is no nearby ATM facility. In case of emergency, there is primary health centre in the village. Wear drark green or brown shed dress during safari. Don’t wear fancy, attractive dress. In Chikhaldara, there are few places to visit like Hurricane Point, Prospect Point, Devi Point, Gavilgad and Narnala Fort, the Pandit Nehru Botanical Gardens, the Tribal Museum and the Semadoh Lake. In Chikhaldara few points are good. Monsson and winter seasons are good to visit Chikhaldara. Do not think to visit Chikhaldara in summer season. "if you want to enjoy the untouched beauty of nature then this is the place for you. I think this is one of the best places for honeymoon." where do you begin? First thing you can do is start out incorporating neighborhood to your own key terms.